The Ecoteck Laura freestanding pellet stove has the option of being able to be attached to ducting to form a whole house heating solution. The stove body is in black painted steel, with majolica highlights at the front corners and the top. The majolica panels are available in black, bordeaux and titanium colours. Producing 44,000 btu. an hour, the Laura is capable of heating up to 1,800 square feet of living space. The hopper capacity is a large 66 lbs, enabling the Laura to run for up to 60 hrs. without refilling. Remote control, GPRS text message control and a wall thermostat are available as options. Window Size 16 in. by 12 in. Rear Vent Height 8.2 in. 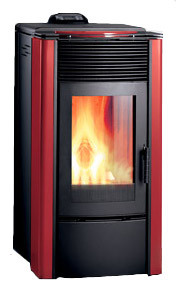 If you would like to leave a review of the Ecoteck Laura ductable pellet stove, please use the form on the contact page.